Forewarning: You may experience a ‘pep’ in your step after you read on to see why you need more bell peppers in your life. In truth, bell peppers are a staple for just about every household. They provide superb nutrients for the body and mind, are low in calories, and are a great vegetable added to many dishes for that pop of color that just so happens to be packed with vitamins and antioxidants. Since bell peppers come in a range of colors, they really do add that extra something to numerous dishes. Red, yellow, orange and green bell pepper colors may come to mind. Which color do you usually reach for? A variety? Just the red or yellows? It’s interesting to hear feedback from people if they can taste a difference in the various colors and why the average household gravitates towards certain colors. It is said that the green and purple colors can be a bit bitter at times, whereas colors such as orange and yellow are much sweeter tasting. 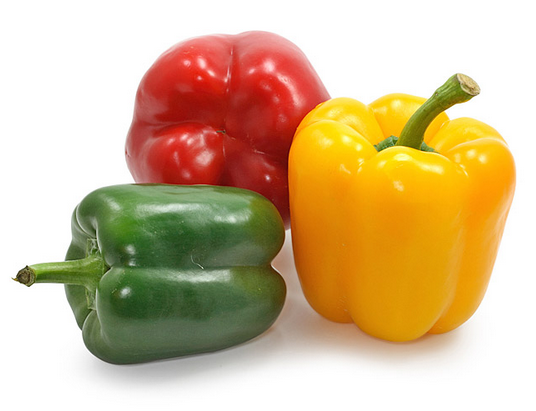 Oftentimes you will see three colors bundled together for sale, such as green, red and yellow, and these are often sold as “Traffic Light Peppers.” The color development comes from color pigment from their carotenoids. These pigments and carotenoids are subject to change through growth and maturity. We can thank our guy Christopher Columbus once again for bringing over one of the most widely consumed vegetables known to us today. It is said that Columbus rounded up peppers and delivered them from the West Indies to Europe in 1943. As for how the iconic colorful veggies got their name, apparently, the European culture referred to the newfound dried veggie as “hotter than the pepper of the Caucasus,” referring to plain black pepper. What Columbus brought back was most likely a range of peppers, some hot and some sweet (bells). Up until this point, daily used black pepper was the only “pepper” commonly referred to. As we well know, there are many different varieties of peppers around the world today, and this is not a commodity you want to get mixed up, or you might be in for a real hot surprise! It’s important to note that our everyday black pepper (table pepper) and sweet and hot peppers (garden peppers) are very different. Whereas black pepper lies in the seeds of the plant Piper nigrum, the garden peppers are referred to as Capsicum. Since the term pepper was already associated with heat and spice, Europeans categorized the hot peppers Columbus brought back as just, peppers. As for the similar family kin of peppers – the bell peppers – were noticeably sweet and not spicy, where they originated the name “bell” as commoners thought the shape resembled that of a bell. We start seeing recordings mentioning the verbiage “bell peppers” in the 1600s by the author Lionel Wafter in his writings. The Capsicum species’ name derives from the nightshade family of plants. This category does indeed include all kinds of varieties of peppers, from chili peppers to jalapeno peppers – and yes, even sweet bell peppers! The average individual can typically tell bell peppers apart from the spicier varieties although they share the same species category. But we always recommend double-checking labels/variety when purchasing peppers at specialty grocery stores to make sure you are getting exactly what you came for! In industry talk, a good-looking bell pepper is commonly referred to as “blocky.” This means the lobes on the pepper, essentially the different sections when cut open, are nice and blocky with three to four lobes. Think of it in terms of a well-rounded pepper that is aesthetically pleasing to the eye. That small detail in the shape of bell peppers is very important for resale because four lobes make for more aesthetically pleasing dishes, such as stuffed peppers. Typically people know that bell peppers have highly concentrated Vitamin C. What else do bell peppers give our bodies in terms of nutrition? Raw bell peppers are made up of 92% water, which makes sense if you have ever bitten into a raw slice. You can almost taste the fact you are consuming hardly any calories at all – frequently only about 30. 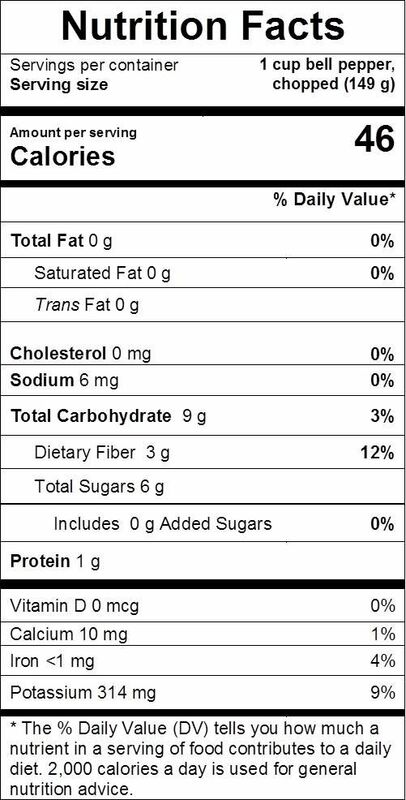 The remaining 8% is a small combination of carbohydrates, protein, and fat. The carbs are what we can account for where the calories come in. This makes sense since this is where the sweet component of bells come in – often sweet means carbs and sugar. Other than the apparent major component of Vitamin C, bells have Vitamin E, A, B6, K1, Potassium, Folate. The antioxidants of bell peppers through these vitamins and minerals are said to help with anything and everything, down to the health and development of our eyes, to helping combat Anemia. These antioxidant properties go far beyond the surface in helping regulate levels in the body for overall health. Feel like it might be time for your weekly grocery run after reading all this goodness? Great. Then let’s make sure you pick out the best bells on the shelf. It is recommended that you select bell peppers that have matured into intensely pigmented colors with tight skin – never shriveled – and they should have healthy looking stems. Interesting fact – the shape of the pepper doesn’t always affect the quality inside the pepper, but making an effort to choose the most aesthetically appealing ones – with three or four lobes – for a more versatile vegetable is often preferred. Bell peppers are meant to be firm. As with many vegetables, how to find the best and ripest is dependent on the firmness, and although bell peppers are more lenient than say, avocados in terms of ripeness, keep in mind the firm skin on the bell pepper is generally a good indication of the consumption time frame.